An out of this world adventure for little astronauts. 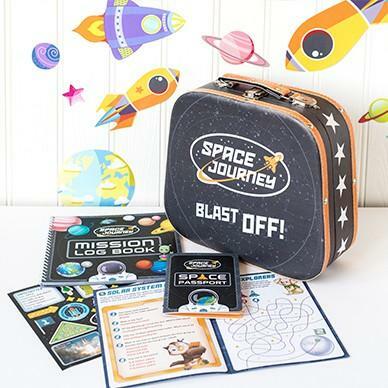 Start with a little astronaut kit with a suitcase and learn about a new planet every month. Follow the adventures of characters Geo and Atlas as they explore the solar system and send your child letters, photos, stickers and much more! Every month receive a cool souvenir such as astronaut food or space sunglasses. 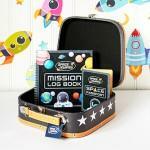 Astronaut kit includes space suitcase, mission log book, astronaut passport and large map of the solar system. 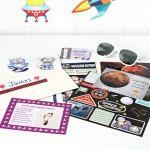 Also includes stickers activities relating to planet Earth to get started. Future planet packs contain letter, photos, fact cards, stickers, activity booklet, travel ticket and a souvenir. To personalise your subscription with a child's name, please enter this into the recipient details. Be the first person to tell us what you think about Space Journey and you'll save £2.50 on your next purchase!